Self-Expression. Expressing ourselves in constructive ways is a learned skill. We all know at least one person in our life who isn’t great at controlling their anger – perhaps a coworker, friend or neighbor calls people names or slams doors when they don’t get their way. To become successful adults, we must learn to channel our frustrations in a positive way. The arts open the door to self-reflection and self-expression. Learning to communicate through dancing, drawing, writing, or other arts offers a constructive method for a teen to share his/her identity or wrestling with difficult questions. Stress Relief. Many artistic activities take place in a relaxing environment and offer constructive and safe methods of communicating. Troubled teens are under an enormous amount of stress, and many times, they are not taught how to manage it. In an increasingly complex and pressure-oriented world, teens need positive coping skills. The more our community’s youth are able to find positive ways to deal with stress, the better off we all are. Studies have proven that the arts can be great stress-relievers and coping mechanisms. Examples include listening to music, dancing, drawing, writing in a journal, painting, or playing a musical instrument. 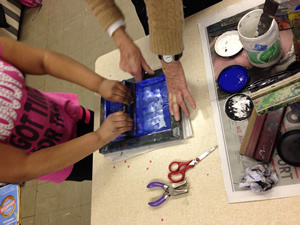 An arts program can open the door to positive stress management. Real-World Skills. Many artistic activities, such as journalism or photography, teach real-world skills, which can lead to lifelong interests, even careers. They help kids explore their physical, creative, and social potential and find out where their interests may lie. Creativity. Artistic programs can provide an outlet for creativity and problem-solving and encourage a youth’s natural curiosity and interests. The arts provide effective, engaging and creative methods of mental, emotional and physical stimulation, which encourages the overall creative thinking process. Self-Confidence. For a teen who is not gifted academically, the chance to excel in the arts can make a huge difference in their self-esteem. Additionally, when children learn new skills and engage in social activities, they become more self-confident. Learning social skills, like cooperation, negotiation, and conflict resolution, in a fun and relaxed environment, will help them interact appropriately with others – a skill valuable in all aspects of life, from home life to the workplace. The most effective arts programs for youth contain activities that are designed to provide opportunities for youth to learn new skills, recognize individual youth’s efforts, and reduce the influence of risk factors. These programs become a safe haven for a teen. Successful programs emphasize dynamic teaching tactics such as hands-on learning, apprentice relationships, and the use of technology. They also usually culminate in a public performance or exhibition in an effort to build participants’ self-esteem through public recognition. Middle Earth, the writer of this blog, is currently trying to launch this type of art initiative in Central New Jersey. As a local nonprofit that has been working with at-risk youth for over 40 years, we are always seeking new ways to help guide youth on a path to responsible adulthood. Our new arts initiative, entitled The Art House, would help teenagers who struggle with chronic family problems, low income, poor academic performance, low absenteeism at school, and other factors that can lead to risky behaviors. Once launched, The Art House will bring in an artist, once a month, who specializes in a visual arts, theater, or music medium. The artist will provide the teens with workshop instruction and guidance that mimics an apprenticeship. There will be a community exhibit at the end of the program. The Art House initiative is unique because it combines a casual drop-in style program with exciting opportunities in art and professional mentorship. Middle Earth is trying to raise funds for the space and the supplies they need to launch this innovative new program. Watch our video about this new initiative or make a donation! Students who spend no time in extracurricular activities, such as art programs, are 49 percent more likely to have used drugs and 37 percent more likely to become teen parents. If you want to encourage a generation of troubled youth to creatively pull themselves up from an impoverished or abusive family cycle, avoid delinquent behaviors, and get more excited about their education and future, then our community needs to better equip our youth with the tools to think creatively. The arts can empower a child to imagine a better future and choose a more positive path in life.